It’s a personal observance when I say people tend to travel more to the south or to the east, than they do the west (more towards Negambo and Kalpitiya). It’s a shame though. Each and every part of our island is blessed with beauty. The bestie and I make plans to travel together every two-three months and on our last vacay of 2017, we decided to head to Jetwing Lagoon in Thalahena, Negambo. Somehow, we’d always pick a place that’s close to the ocean or water of some sort. It’s an island living thing I suppose. As impromptu as the decision was to go to Negambo, I had made our booking from Friday till Sunday. As someone who works part-time, I suggested we leave around noon so that we’d get there just in time to check in. Of course, it’s hard to stick with time being Sri Lankans and with a few quick errands to run with an infant on board, we finally left Colombo around 3pm amidst a crazy traffic jam. Feeling ever so grateful for the Katunayake Expressway, I missed the closer exit to the lagoon and instead wasted a further 20 minutes taking the longer route to the hotel. Google Maps to the rescue! We did stop by a grocery store to stock up on a few munchies – being typical locals here – and finally got to the hotel close to 5pm. The Jetwing Lagoon is an Ayurvedic and spa resort and located just beside the lagoon. A newly acquired section of their pool and lounge area faces the deep blue Indian Ocean on the opposite side of the property. The design and architecture has great significance and are undeniably very striking. 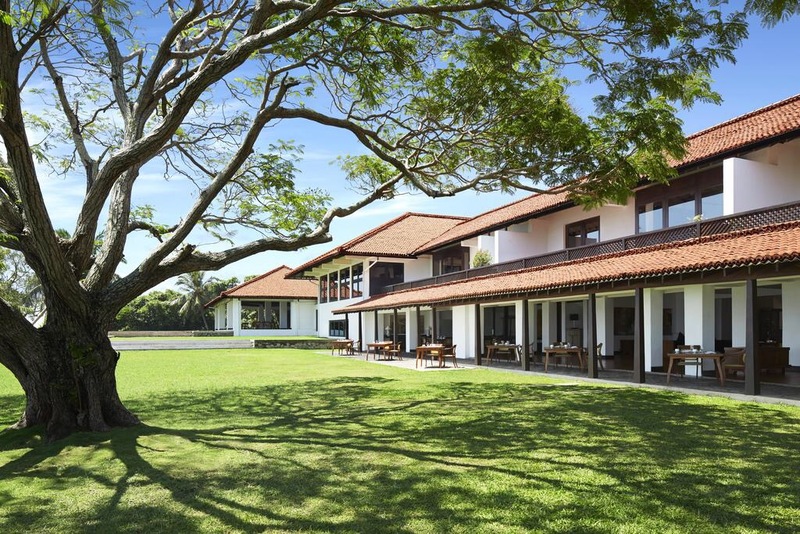 The resort is known to have been the first ever to have originally been built by the renowned architect Geoffrey Bawa in the year 1965. If you happened to think the property has an aging look to it, think otherwise. As per other properties run by the famous hotel chain, this one is well maintained and up to standard. The style and design of every space includes a great deal of white washed walls and textures of brown in the use of wood, wicker and even linen around the rooms and property. Lush foliage surrounding the rooms and also the dining areas add a look of serenity and simple wildness. One of the most prominent features is the pool, which happens to be the longest on the island – a whopping 1,100 meters in length! It took a few minutes to get check-in and in the meantime, bestie and I had already racked up a couple of photos of our surrounding and also sneaked in a few selfies with the little one. And then it was a quick buggy ride to our Bawa room. We happened to pick one of the larger room purely because of her infant – we’d requested for a baby cot as well and didn’t want to crowd the room with additional furniture. The room was decorated quite aesthetically pleasing to the eye with simple yet polished furnishings, added amenities like mosquito repellants, an umbrella and notes on the brand’s belief in sustainability. The bathroom was expansive to the say the least and open on one part to the foliage and sky. This unfortunately was a bit problematic as come evening, there were too many mosquitos to count and handle. The repellants did not do justice and the two of us went on a killing rampage for a good while. 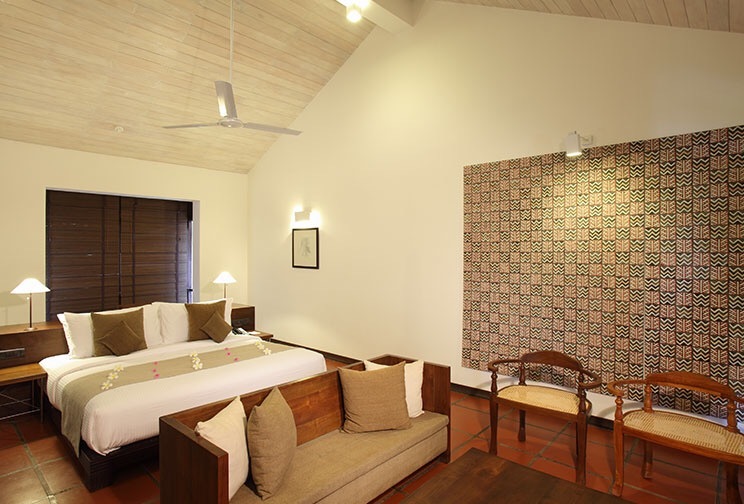 The resort is also home to plenty of other types of rooms including deluxe rooms, family rooms, and suites. Without much of a meal for lunch, we decided to head over to the restaurant for an early dinner. Light rain was a bit of a struggle to get through with an infant on board but luckily, the umbrella came in handy and we picked a nice spot next to the gardena and lagoon. Our dinner was a set menu without a few selections of choices for an appetizer, main and dessert. This is something the resort offers when occupancy in somewhat low. The next night’s dinner was buffet style due to an increase in occupancy. The food is quite commendable although there were a few hits and misses during our two night stay. I have to admit, the crab curry was to die for and breakfast is a must have. The town and city of Negambo has a long history of being a fishing hub and therefore a cultural beauty. There are a multitude of attractions in the area from cultural excursions to water sports to keep one entertained for a couple of days. The town is a mere 15 minutes away and there’s plenty of famous spots to explore, including the Dutch Colonial Fortress. The bestie and I did not venture out but I hear unfortunately that the fortress is not being protected and conserved well. Definitely something to look into. The fish market and little shopping areas by the beach are bursting with life and colour; something a lot of bloggers tend to highlight and photograph. The second day of our stay was a pretty relaxed one. The thought of a dip in the pool was however interrupted by light rain and overcast skies throughout the day. Guests can spend a few hours in that case at the dedicated Ayurvedic spa on the property, located just beside the pool. 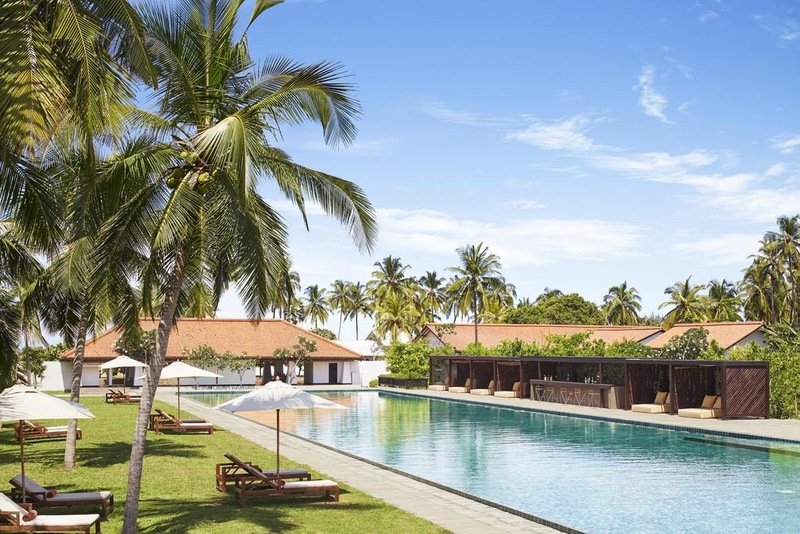 The rates seemed pretty decent and the resort also offers a few package rates which includes a few hours of a massage and then an Ayurvedic lunch, as well as a tour relation to the work of Bawa. We had a few issues with dealing with the mosquitos once again but unfortunately, it wasn’t completely addressed. The repellent wasn’t much help the first night and all three of us kept waking up multiple times to the annoying buzzing and biting. We decided to not open out the windows and always keep the bathroom door locked just to keep the insects out and this somewhat eased the annoyance on the second night. If you’re someone who happens to be interested in the brand’s sustainability efforts, there’s information available in the form of a brochure as well as a video on the room television. From recycling rainwater to water their plants and lush garden to their reduce use of energy and growing their own produce, Jetwing certainly strikes me as a hotel chain that goes an extra mile to ensure their impact on the environment and wilderness is a positive one. Come Sunday, it was breakfast, half an hour in the pool, a quick lunch and then check-out for us. The staff at the reception were extremely accommodating and a brief moment, I was truly sad to leave. But there’s always the promise of coming back in the air.